TEMPE ­– Just over five years ago, Shaquielle McKissic’s life was in turmoil. First, he was arrested for attempted residential burglary in his native Washington state and served two years’ probation following three months in jail. The following year, his closest friend was shot and killed outside a party. After garnering major college attention his senior year of high school in Kent, Washington, in the 2008-2009 season, he was unable to play collegiate basketball for two years until he saved enough money to register for classes at Edmonds Community College in Lynnwood, Washington. Set to begin his second season starting at guard for the Arizona State men’s basketball, McKissic said he looks to get past his hard times and struggles. In his first year with the Sun Devils, McKissic averaged 9 points and 4.5 rebounds per game as ASU finished 21-12 and made its first NCAA Tournament since 2009. McKissic’s road to ASU began when assistant coach Stan Johnson, as part of an effort to recruit more junior college transfers, got wind of his talent. “We’re certainly happy we did that,” he added. 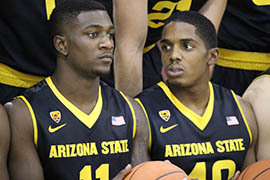 McKissic is just one of several junior college transfers who have paid of for ASU in the last four seasons, but Johnson admitted the staff’s reservations about McKissic. “He was the one guy we didn’t know what to expect of him coming in,” he said. McKissic gave them no reason to worry. In light of his complicated past, the NCAA granted McKissic with an extra year of eligibility so he could return for this season. ASU’s 2014 roster includes four newcomers, some from junior colleges. McKissic said he’s excited to play with JUCO transfers because he can relate to them. “I feel like we have an extreme amount of heart. Playing with JUCO players, everybody has a chip on their shoulder,” he said. Head coach Herb Sendek said he agrees with McKissic but would word it a different way. Gerry Blakes, a transfer from San Bernardino Valley College, said the youth of the team makes it dynamic on the court. “I feel like we’re a great defensive team. We have a lot of athletes this year,” he said. Savon Goodman, a sophomore forward who played one season for UNLV, said the team has obvious flaws but is aware of the identity it wants to have. Goodman spent last season at Indian Hills Community College in Ottumwa, Iowa, but did not play. Sendek said the anatomy of this team is unlike any other team ASU has ever had and that the sport is made for rosters featuring transfers. “It just seems to make great sense, the way college basketball has evolved and where we’re positioned to attract the best junior college players in the country here at Arizona State,” he said. Junior college transfer Shaquielle McKissic (right) and Savon Goodman, who transferred after playing for UNLV, are a big part of the Arizona State men's basketball team's plans for this season.